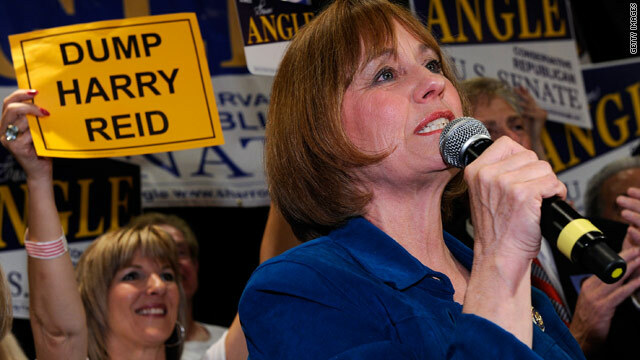 Tea Party-backed candidate Sharron Angle hopes to unseat Senate Majority Leader Harry Reid in Nevada in the fall. (CNN) -- As Sharron Angle celebrated her win in Nevada's Republican Senate primary, she praised the Tea Party activists who backed her campaign and vowed to return the country to its constitutional principles. Angle, a former Nevada Assembly member criticized as being too far from the mainstream to win, soared to the front of the crowded field of more than a dozen GOP candidates. She'll face Senate Majority Leader Harry Reid in the general election. The Tea Party Express, which endorsed her campaign, declared Angle's win "a huge victory for the Tea Parties." But so far this election season, the message for Tea Party activists has been "you win some, you lose some." As Angle was declaring victory, several time zones away, a slew of Tea Party candidates were going home empty-handed after establishment candidate Robert Hurt stomped them in the primary race for Virginia's 5th Congressional District. Despite a nationwide wave of anti-incumbent fervor and a Tea Party cry to "throw the bums out," far more sitting lawmakers have survived than have been ousted. "Races are an odd thing," said Judson Phillips, a Tennessee lawyer and founder of Tea Party Nation. "Despite the national discontent on a lot of issues, the truth remains, so much of politics is local. It's hard to draw a conclusion from the results we've seen because there are so many variables in play." Even though Tea Party candidates aren't shutting down their opponents, Phillips said the Tea Party -- which is a conservative movement and not a political party -- is doing well and is healthy for the country because it's getting newcomers involved in politics. Tea Party activists also have had a notable impact on the tone of some races, said Alan Abramowitz, a political scientist at Emory University. "I think generally what we've seen across the country is that even when the Tea Party candidates have not been successful, in many cases, they have forced the other major Republican candidates to move to the right," he said. Texas Gov. Rick Perry faced a Tea Party challenge from Debra Medina in the Republican primary for the gubernatorial race. Perry, taking a page from the Tea Party movement, capitalized on voter frustration and overspending in Washington and pinned his other challenger, Sen. Kay Bailey Hutchison, as a creature of the Washington culture. Perry won with more than 50 percent of the vote. "This movement is such a new movement," Phillips said. "This is the first election cycle where the Tea Party has mattered. What's clearly going to happen as a result of this election cycle is that we're going to learn." Tuesday night's results, for example, have caused Phillips to reconsider whether his group might want to endorse candidates in future races. Tea Party Nation chose not to endorse a candidate in Nevada's Senate primary since there were multiple strong Tea Party activists in the race. The Tea Party Express endorsed Angle, who was at one point polling at 5 percent. The group poured $500,000 into the race and helped her pull out a win. Another problem that's come out this election cycle -- Tea Party candidates not true to the movement, Phillips said. He said he suspects some people are running on a Tea Party platform to further themselves instead of the party. "In the last year, a lot of people who have political aspirations have locked onto the Tea Party movement because they see that as their ticket to achieve their political dreams. The problem with some of these people who are running as Tea Party candidates is that it is politics as usual," he said. The tougher test for the Tea Party will come in November when the conservative candidates will face off against Democrats in the general election. Republicans are expected to make big gains since historically, the party in power loses seats in the midterm election. But there's speculation those gains could be diminished if Republicans field a lot of far-right contenders that don't appeal to moderate voters. "When you nominate candidates who are extremely conservative -- especially in some of these swing states ... I think that could end up costing Republicans some seats that they might have won if they had nominated candidates who were more moderate," Abramowitz said, adding that in states such as South Carolina where the electorate is already conservative, it probably won't make a big difference. Phillips, however, said he isn't concerned about Tea Party-backed challengers not being competitive in November. "I'm not that worried about the moderates. Moderates are just people who don't have any core beliefs. They're neither liberal nor conservative -- they're just kind of there," he said. "I don't accept the premise that all moderates will automatically defect to the Democratic or liberal candidate. Some will, some won't." Phillips said the Tea Party has energized the conservative base -- and that's what delivers victory.